A group of kids from a local Christian School were singing ‘God Bless America’ as the National Day of Prayer program for 2015 ended. People were milling about, conducting their own little inventory to be sure they were leaving with everything they came with. I wondered as I watched them secure their assorted bags and gadgets, intent on not forgetting something, how many of us, if any, were going to be leaving with something we didn’t already have with us when we came. After all, wouldn’t it be reasonable to expect that if we’re calling on God to respond to our prayers and give us something, that some of us would leave with some of whatever it is that we were begging Him to give? disappointing. It didn’t seem to be greeting us with the kind of dramatic improvement worthy of the fervor of the prayers and declarations we made on this same spot a year ago. Last year’s efforts certainly seemed sincere. We called on God with fervent boldness, and loud speakers, and suggested that He should pour out His Holy Spirit in an unprecedented deluge of power and purify the Church. We expressed our desire that He should afflict all those wolves in sheep’s clothing with wardrobe malfunctions, and ‘out’ all of those under-cover Pharisees infiltrating the pulpits, and other places of leadership. Then we figured He should wrap it up by getting multitudes of those hedonistic, pleasure-mad heathen to abandon their sinful compulsions and come to Jesus like they ought to. It sounded like a good plan, but something must have gone wrong. What if we set apart the day after our big meeting with God and plan to review, evaluate, and celebrate all that God did, in response to our pleas the day before? We could call it the ‘Day After the National Day of Prayer’ Day. I wonder if today’s well-rehearsed praise songs, moving testimonials, impassioned declarations, and eloquently delivered prayers imploring God for a manifestation of His power will have made any difference when the ‘Day-After-the-National-Day-of-Prayer’ Day arrives tomorrow. Well, let’s be honest, God isn’t deaf. He did hear us last year, and He heard us again this year, and He heard us all those other years. I have no qualms or questions about whether God heard all the stuff we were sending up. The deeper issue is not whether He got what we were handing out, but whether we received anything that He had to offer. Prayer is not like playing a spiritual lottery, where we toss out a few requests and hope we hit the right combination of words on the right day. Prayer is dialog, not just declaration. It’s an interactive exchange between two participants, both of whom have something to offer. It isn’t just an empty, one-sided rhetorical review of religious platitudes. If we don’t come away from those important divine interactions in possession of something we didn’t bring with us, then neither of us achieves what we hoped for. I recall standing at the curb in our neighborhood with our grandchildren one cold evening in December as a little string of fire trucks, police cars, and ambulances rolled slowly down our street. The main attraction was a large fire truck decked out with Christmas lights and loudspeakers that filled the air with Christmas music. There was a local celebrity or two, but center stage belonged to Santa Claus, who was waving to everyone and throwing candy and little Christmas trinkets to the crowd as they passed by. Kids were scrambling after them like the future of human life itself depended on getting some. When it was all over, and our quiet little street assumed its normal nondescript character, the only question of interest to the boys was, ‘Did you get anything?’ The colored lights were nice, and the music was good—Santa’s beard could have used some work, but the whole event was basically no more or less than what everyone expected. When it was over and the crowd dispersed, the only thing of value from the experience was whether the boys had anything to take home that they didn’t bring with them. 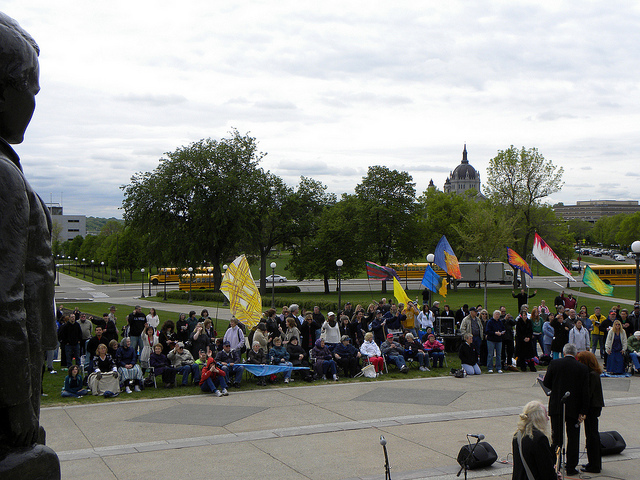 What if all of us left our National Day of Prayer gatherings with that kind of perspective? After all, America will not be impacted one way or another by how well we sang, or how powerfully our speeches were delivered, or how passionately our prayers were offered. The enduring question for me as I leave this year is whether I got any of what God might have been handing out today. I don’t know if next year will find an America that is spiritually stronger or not. I don’t know if next year will find an America that is more morally pure or not. I don’t know if next year will find an America that is wiser, with more integrity, and that is more sure of its place and role in the world or not, but those aren’t the questions. As I anticipate greeting God at the dawning of another ‘Day After the National Day of Prayer’ Day, the question is not whether God will be looking at an America manifesting those improvements, but whether He will be looking at an ‘American’ who is. This entry was posted in Faith and Politics, Faith, Family, and Culture, Insights, Wake Up Calls and tagged National Day of Prayer. Bookmark the permalink. Good and thought provoking dear brother, my take is very simple, we as individuals must keep the focus on The Lord Jesus Christ and remain steadfast and faithful to the One who is faithful who will also accomplish His work in us.I Thess. 5: 24. Amen and Amen to what you have said. I pray God will find me changed and hearing His quietest whisper. I do pray for changes to occur in our precious country, but I know the change begins in each of us as we seek Him, hear Him and follow Him With no hesitation and Boldness. God Bless You as you do all of these things!